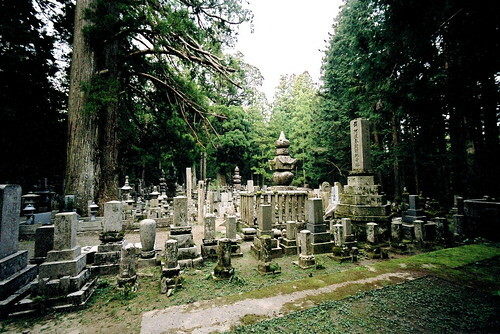 Although Jess and I were tired, we couldn’t leave Koya-san without visiting the vast cemetery area of Okunoin, a graveyard of some 200,000 tombs that line the path that extends from Kobo Daishi’s mausoleum. It’s almost impossible to convey the sense of scale of the Okunoin cemetery. 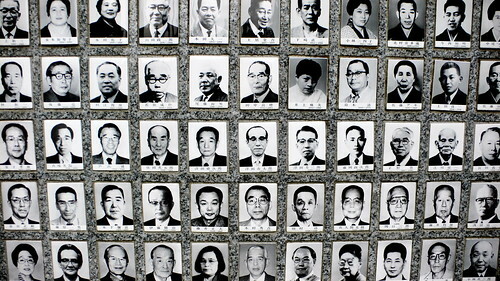 It’s about a twenty-minute walk from the entrance area at Ichino-hashi bridge to the mausoleum, and during the entirety of that time you are surrounded on all sides by thousands and thousands of stone gravemarkers, many of them larger than a person and weighing several thousand pounds. The twilight dusk falls quickly here, generating a green sense under the trees, and moss grows abundantly on the tombstones, creating a kind of living verdigris patina. 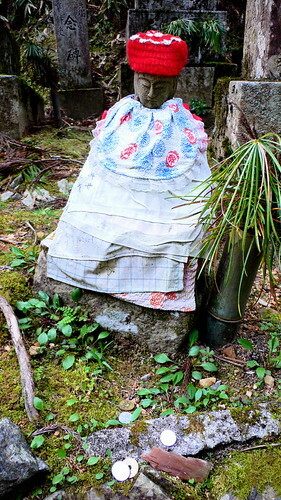 In some places the gravemarkers are so old that they’ve tumbled over into anonymous moss-encrusted piles. 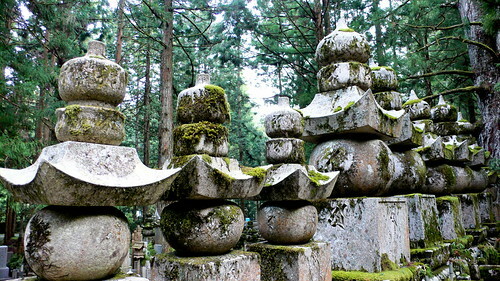 The tombs at Okunoin include those of Honen, Shinran, Oda Nobunaga and Toyotomi Hideyoshi. The path to the mausoleum of Kobo Daishi follows the course of the Tamagawa river. 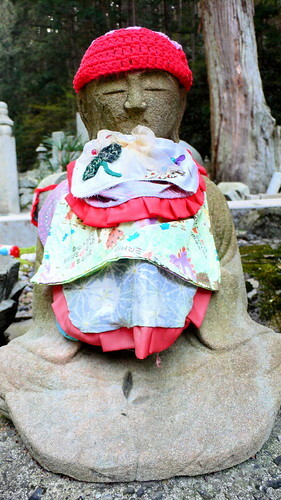 At the Mimyo-no-hashi bridge there are a line of Jizo statues in brightly colored bibs and worshipers ladle water onto these statues as offerings to the dead. There is a deep, black wetness about these statues in the dusk. Wooden markers with the names of the dead are placed around the feet of the statues, or in the river itself, in memory of aborted babies and those who have drowned. 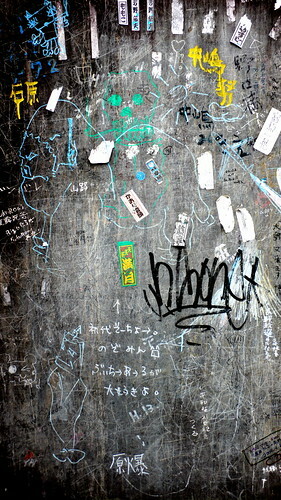 Unfortunately, there are no photographs allowed within the central sacred precincts of the Okunion area. Both the Torodo (The Hall of Lamps) and Kobo Daishi’s mausoleum are off limits to the intrusions of the camera. The Torodo is Okunoin’s central structure and it houses hundreds of lamps, including two that are said to have been burning continuously for 900 years. To the right of the Torodo is the Memorial Hall of Lamps, a second building constructed to house additional lamps and scriptures. Unfortunately, by the early evening, both of these buildings were closed, so Jess and I were unable to see the lamps. But we were able to see the closed doors of Kobo Daishi’s mausoleum, with several worshipers standing solemnly in front, gazing ahead while holding lit candles. The mausoleum is protected by a gate that is always closed, and within this gate is a cave in which Daishi sits in a meditative posture, waiting for the coming of the Miroku Nyorai. Okunoin is dotted with monuments, including the North Borneo War Memorial, which commemorates the Japanese, Malay, and Australian soldiers killed there in WWII, and the White Ant Memorial which was apparently built by a pesticide company to atone for the suffering they cause to insects (Jess and I were able to see the Borneo Memorial, decorated with the flags of the three nations, but we didn’t come across the Ant memorial). 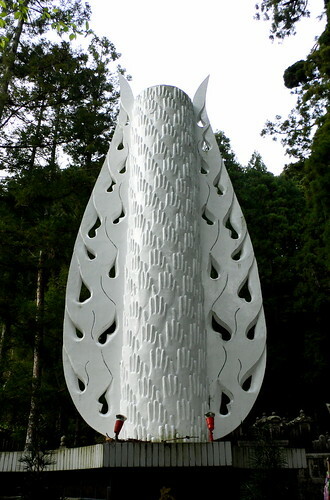 I’m not precisely sure what the monument in the photograph above memorializes, but my guess — judging by the flame motif and the ascension of the hands — is that this is a memorial to the victims of the atomic bombings of Hiroshima and Nagasaki. I have no idea who is entombed here, but the gravemarker is covered with awesome graffiti and the name markers of people who have come here on pilgrimage. 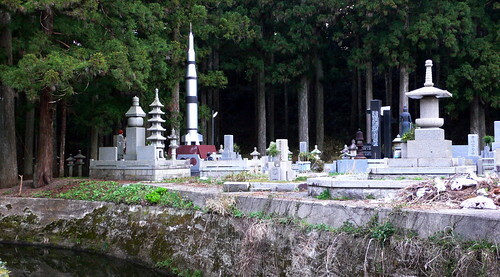 Yes, that is a rocket over among the headstones and pagodas. 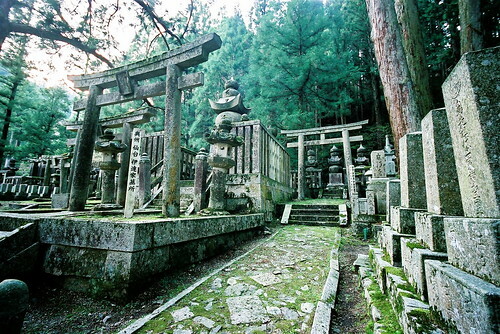 Apparently, several of the monuments at Okunoin have been placed by companies, and perhaps that explains its existence here. Or perhaps the person buried there was a kind of proto-Lance Bass and just really, really wanted to be launched into space. 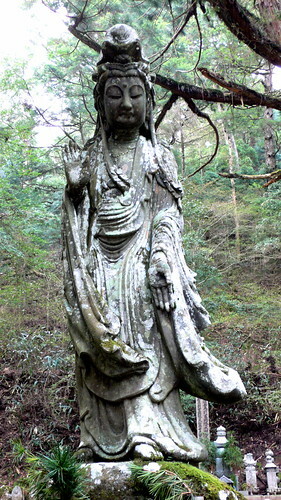 Of course, the cemetery is also dotted with more traditional offerings, such as this statue of Kannon. 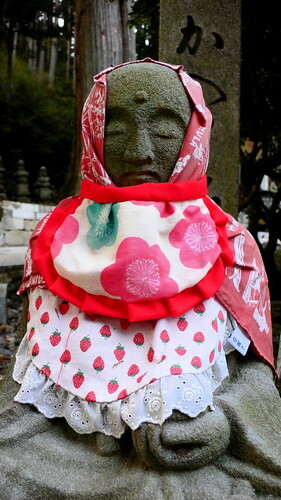 There are also hundreds, if not thousands, of bibbed Jizo statues that silently watch over the dead. 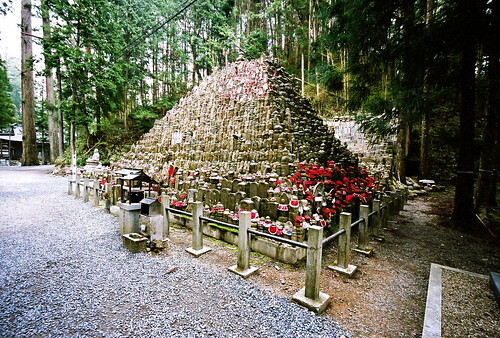 This is a mound made up of thousands of Jizo stones. Close to the Torodo is a similar mound, although that mound has an entrance, and appears to be hollow inside. 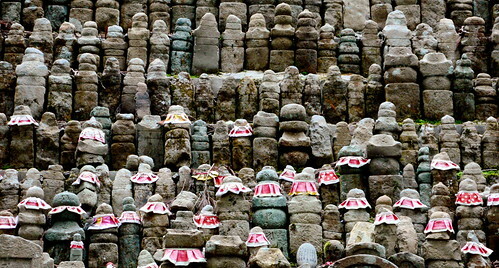 A closer view of the Jizo stones. 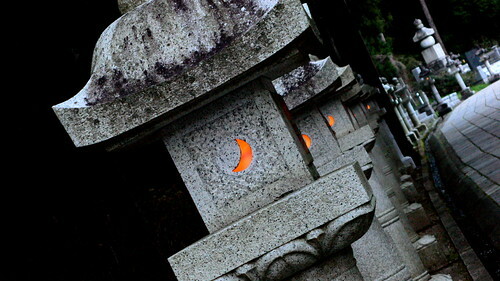 By the time Jess and I returned from the mausoleum of Kobo Daishi, all the lamps along the entrance path had been lit. Just as night was falling, we caught the last bus from Koya-san, and we were the only two people riding the train down from the mountain. The train clanked along through the night, from empty station to empty station, until finally we rejoined the main lines connecting us to Osaka and the trains filled up again. Alice — Thanks for those kind words about my photos and about the site. I had an amazing visit to Koya-san and am definitely planning on going again when I have some more time. Glad I could help you to identify some of the sites that you visited! I always find that’s a bit hard to do after the fact as well. Nice coincidence about the DeVore connection too — especially since most DeVores dropped the capital ‘V’ a long time ago.